What's better than one perfectly baked, golden brown Belgian Waffle? TWO! The Waring Pro Double Belgian Waffle Maker does just what it says it will do, baking two deep-pocketed big Belgian waffles at once, to the shade you like best. 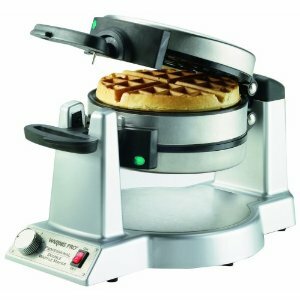 The unique rotating feature ensures that both waffles bake evenly on both sides. So whatever you top them with whipped cream, syrup, berries, peaches or ice cream, it doesn�t compete with the crunch. And the pockets are one-inch deep, so there is plenty of room for the kind of toppings that make a brunch more memorable and a dessert-to-die-for! And just to make sure every single waffle is perfect, Waring Pro provides all the help you need: 2 LEDS for Heat-Up and Ready-to-Bake, 3 Beeps when waffles are done baking, and a thermostat/browning control to let you please all of the waffle lovers all of the time!